Computercraft Resources - the hour of code in minecraft! 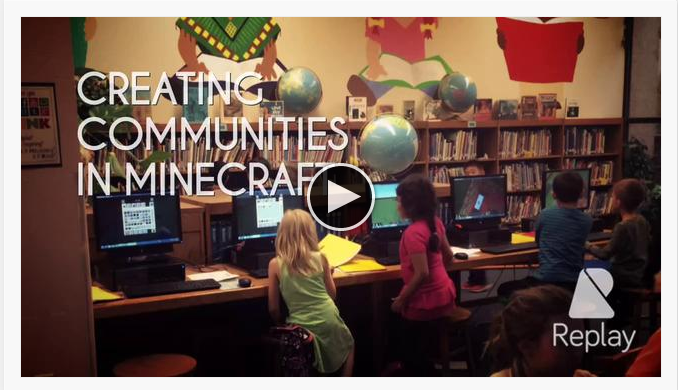 In honor of Sharing the Planet Week at Spicewood, students had the opportunity to participate in a video contest. Mr. Ortiz's fifth grade class created a one of a kind video! 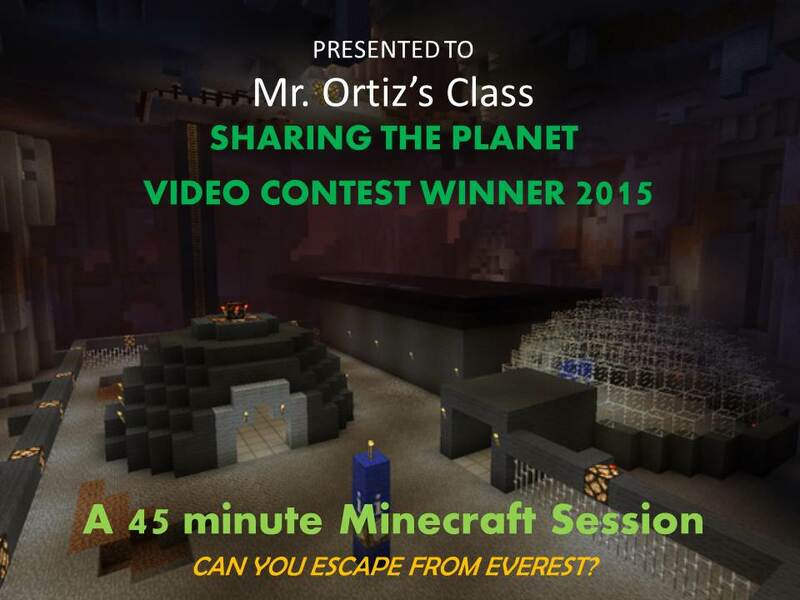 Their prize... a 45-minute Minecraft Session in the world Escape From Everest. The students had to work together to balance environmental concerns with the demands of technological progress. The challenge was to regreen the earth by cultivating new trees on the surface and build a signal rocket to contact the other humans who are living in space. 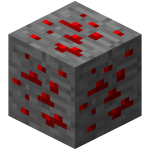 However, these goals were in conflict; there was no coal in the world to smelt the iron so they had cut down and use some of the very trees they are trying to grow to burn as fuel. Students enjoyed the challenge! Our 2nd grade students currently finished up the Unit of Inquiry: Where We Are In Place and Time. The Central Idea states that humans and geographic factors affect communities. Students explored various lines of inquiry such as relationships between geographic features and communities, the characteristics of communities, the impact of humans (development) on the environment, and the relationship between climate and patterns of settlement. 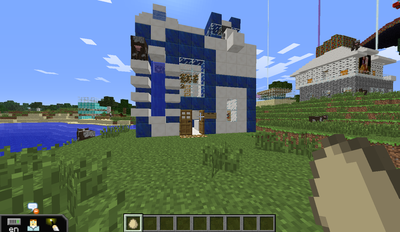 As the final assessment of the unit, students used MinecraftEdu to create a community of their own. Evidence of learning would be student's ability to create a community that effectively represents the characteristics of their chosen type (urban, rural, suburban etc.) as well as their intended geographical location. 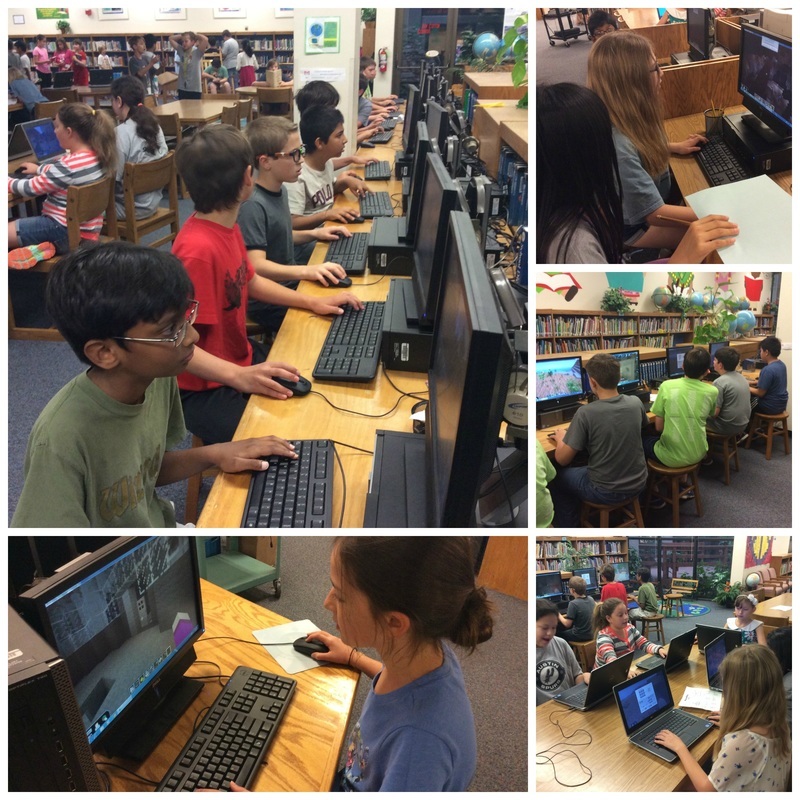 Second grade students were so excited to work on MinecraftEdu to express the mastery of their learning in such creative ways. Mrs. Kim popped in and out of the library throughout the week to see the progression of their work and was simply blown away. They were so engaged and so creative! Technology is truly a power tool for our students who will lead the future! Our students continue to build and add on to their living quarters. They are self-paced so when they're ready to move on to the next achievement, they can. Achievement number two is to establish a food source. We had students planting gardens, cultivating farms, and creating pens for animals. 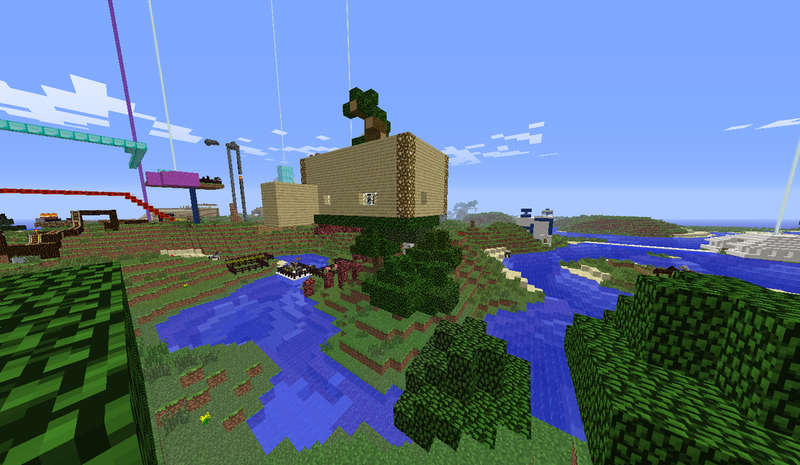 I surprised the kids by telling them the villagers were bored. Right away they suggested a theme park! We tossed around ideas for what our theme park should have and quickly got to building. They discovered it should be close to the village but not right in the middle of it so that it could be pretty expansive (imagine 27 kids contributing to the park). The first student to venture out and break ground added a beacon so the rest of the club could find the location. Roller coasters began popping up as students utilized their knowledge of Red Stone to power the track. 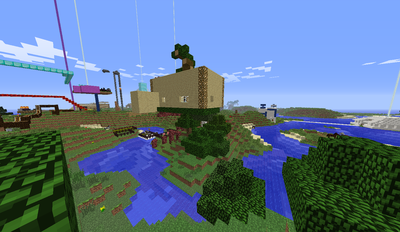 We also have bumper boats, parkour challenges, food trucks, and a lazy river to get from our village to the theme park. I wonder what will it be called? It's amazing to watch these kids work; completely focused, engaged on creating what they see in their imagination, with absolutely zero direct instruction from the adult in the room. It blows my mind. What they don't realize is that they are demonstrating the ﻿4 Cs of a 21st Century Learner: ﻿Creativity, Critical Thinking, Communication, and Collaboration - a skillset required to succeed in the information age. Our students began crafting a model of Spicewood today. Students got started by suggesting which rooms/structures they'd like to start working on and grouped themselves according to similar interest. A few lessons learned today like start a flat world otherwise you'll generate a world that's impossible to build on. Got it! 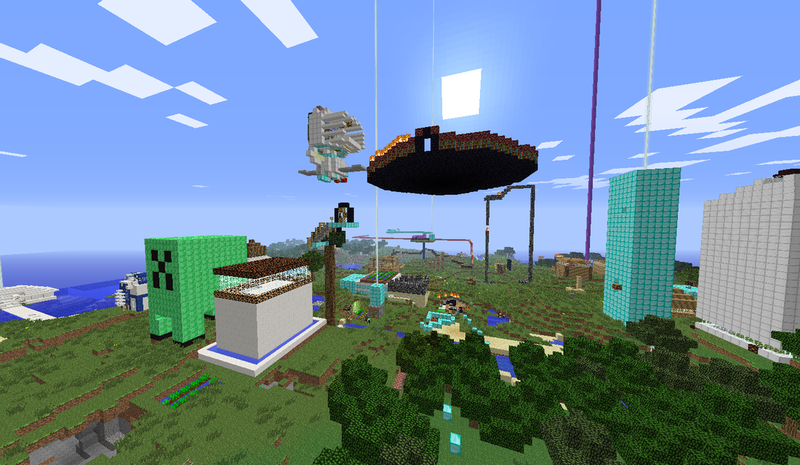 I'm also learning about spawn points and teleporting students back to the build site - that comes in handy.